The Mocoa landslide was a natural disaster that took place in 2017. During the pre-dawn hours of 1 April 2017, locally heavy rain triggered flash flooding and landslides in the city of Mocoa, Putumayo, Colombia, killing at least 254 people, injuring 332, and leaving 70 others missing. It is the third-deadliest weather-related disaster in Colombian history, and is regarded as the worst catastrophe in the history of Mocoa. On 31 March 2017, moist tropical air from the Atlantic Ocean flowed west across the Amazon toward the Andes. A broad swath of ample precipitable water, or atmospheric moisture, extended across this region. During the evening hours, a slow-moving mesoscale convective complex developed within this region and produced heavy rainfall in southern Colombia. Infrared satellite imagery from GOES-13 depicted cloud tops of −90 °C (−130 °F), indicating the storms were capable of producing torrential rain. With the system moving perpendicular to tall mountains, orographic influence likely enhanced rainfall and further contributed to the subsequent disaster. According to residents, the rain became particularly intense between 11:00 p.m. and 1 a.m. local time. A total of 130 mm (5.1 in) of rain fell during the event, largely within a few hours. This caused the Mocoa, Sangoyaco and Mulato rivers to overflow and send mudflows towards residences and infrastructure in the city of Mocoa by 3:00 a.m. Neighborhoods built along the banks of the aforementioned rivers were completely devastated. Numerous poorly constructed homes were leveled, and large portions of the city were left buried in several feet of mud. The disaster adversely affected 17 of the city's neighborhoods, with the mayor of Mocoa, José Antonio Castro, stating some areas "[had] basically been erased". The Independencia neighborhood was entirely destroyed. Approximately 45,000 people were directly affected throughout the city. At least 329 people are known to have died in the disaster. An additional 332 were injured and a further 70 were missing. At least 22 of the injured were in a "delicate health situation" and transferred to Neiva. Another 21 victims were flown to Popayán. President Juan Manuel Santos declared a state of emergency and stated that his "heart and the hearts of all Colombians are with the victims of this tragedy." More than 1,100 soldiers and police officers deployed to assist in search and rescue efforts. Santos labeled the incident "a disaster caused by nature, by climate change." A temporary morgue was established to handle the large number of deceased. The Colombian Red Cross activated its National Crisis Room in response to the disaster and deployed a team of 47 people to assist in recovery. Hospitals in the city were overwhelmed with the influx of patients, and much of the area was left without power and water. By 2 April, more than 2,500 personnel — including 1,400 soldiers and 800 police officers — were scouring debris for survivors. The army provided 63 vehicles, 10 helicopters, 7 boats, and 6 planes for the rescue operation. Médecins Sans Frontières deployed an assessment team to the affected area on 2 April. Farc rebels offered to help rebuild town. ^ Mocoa typically receives 400 mm (16 in) of rain during March. ^ a b c Podlaha, Adam; Bowen, Steve; Darbinyan, Claire; Lörinc, Michal. "Global Catastrophe Recap - April 2017" (PDF). Aon Benfield Analytics. Retrieved 20 June 2017. ^ a b c Jeff Masters (3 April 2017). "Meteorology of Saturday's Colombian Flood Disaster That Killed 254". Weather Underground. Retrieved 4 April 2017. ^ Justicia (2 April 2017). "La avalancha que provocó la peor catástrofe en la historia de Mocoa". El Tiempo. Retrieved 2 April 2017. - Ben Fox and Alba Tobella and SIR XD (5 April 2017). "Years of Warnings, But No Action Proceeded Deadly Floods in Colombia". Time. ^ a b c d "Colombia landslide leaves over 150 dead in Putumayo province". The Guardian. Retrieved 1 April 2017. ^ "Flooding, Mudslides Kill Nearly 200 in Colombia". Voice of America News. 1 April 2017. Retrieved 2 April 2017. ^ a b "234 killed, 400+ injured or missing in Colombia mudslide – Red Cross". RT. 2 April 2017. Retrieved 2 April 2017. ^ Colombia – Avalancha e inundaciones en Mocoa (Putumayo) Flash Update No. 1 (01/04/17) (PDF). ReliefWeb (Report) (in Spanish). UN Office for the Coordination of Humanitarian Affairs. 1 April 2017. Retrieved 2 April 2017. - "Tragedia en Mocoa: "Eran las 3:00 a.m. cuando sintieron el remezón y la naturaleza los arrastró"". El País (in Spanish). 1 April 2017. Retrieved 2 April 2017. ^ a b c d "Tragedia en Mocoa: van 254 muertos y centenares de heridos por avalancha". Semana (in Spanish). 2 April 2017. Retrieved 3 April 2017. ^ "Colombia landslide kills more than 150, injures dozens: local police". Australian Broadcasting Corporation News. Retrieved 1 April 2017. ^ a b Los equipos de Acción contra el Hambre se movilizan en Mocoa tras inundaciones y avalanchas que han provocado 127 muertes (Report) (in Spanish). ReliefWeb. Acción contra el Hambre España. 1 April 2017. Retrieved 2 April 2017. ^ "Tragedia de Mocoa deja hasta ahora 254 muertos y 45.000 damnificados". Noticias Caracol (in Spanish). Agence-France-Presse. 3 April 2017. Retrieved 3 April 2017. ^ "En Popayán son atendidos 21 heridos en tragedia de Mocoa". El Tiempo (in Spanish). 3 April 2017. Retrieved 3 April 2017. 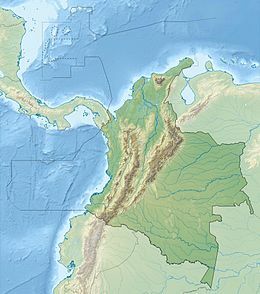 ^ "Colombia landslides: Over 200 die in Putumayo floods". BBC News. Retrieved 2 April 2017. ^ Brocchetto, Marilia; Ramos, Fernando; Sanchez, Ray. "Mudslides kill more than 200 people in Colombia". CNN. Retrieved 1 April 2017. ^ "More than 250 killed in Colombia in flooding, swept away as they slept". CBC News. The Associated Press. 2 April 2017. Retrieved 2 April 2017. ^ Media alert: Red Cross responds to deadly landslide in Colombia (Report). ReliefWeb. International Federation of Red Cross And Red Crescent Societies. 1 April 2017. Retrieved 2 April 2017. ^ Colombia: Assessing the needs after landslides in Mocoa (Report). ReliefWeb. Médecins Sans Frontières. 3 April 2017. Retrieved 4 April 2017. ^ "Colombia landslide: Farc rebels offer to help rebuild town". BBC News. 3 April 2017. Retrieved 21 April 2017.